Named after Charleston, South Carolina, the Charleston is the father of Lindy hop. Its roots extend into ragtime and early jazz music, and it changed and developed alongside jazz through the 20's, and 30's. The basic step is an 8-count stylized walk forwards and backwards. It is danced both alone, and as a partner dance. This is the dance most associated with the roaring 20's, flappers, and prohibition. 20's Charleston was originally danced very upright, drawing focus to the legs. Wild, raw, and extroverted, Charleston developed alongside Lindy hop through the 1930's. 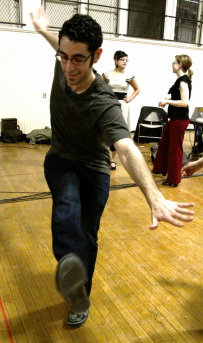 Changes included dancing side-by-side in partnership and a piked, or bent-over, athletic stance shared with Lindy hop.